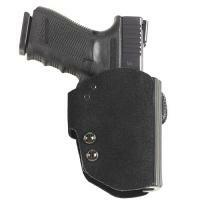 For a lightweight, small footprint, pro-grade holster, look no further then the BlakGuard™ Belt Holster from Galco. Comprised of premium, center-cut steerhide and injection-molded plastic, it is streamlined for a smooth, efficient draw. Quick adjustments are possible with the twin adjustable tension units that ensure effortless draws. The neutral (vertical) cant provides the most natural wrist-locked draw stroke. The tunnel-style belt loop is secured with Velcro® and opens and closes easily, allowing for swift attachment and detachment. The holster easily accommodates most suppressor sights due to its "trench"-style sight rail. Low on frills, high on function and durability, the BlakGuard™ is a dependable holster for daily use.